Such a refreshing Saturday afternoon. One session in the morning, then did some chores at home. After lunch, headed for Sangubashi....it's like a backyard of Meiji Shrine.. say, if the main gate of this shrine is Harajuku side. This side is more quiet... like a quiet picnic place... always relaxing. Bought 3 big avocados which are from Peru ( usually avocados sold in stores are Mexican, so it was unusual. ) . 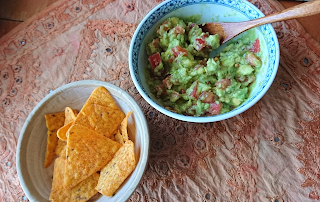 Enjoyed guacamole with chilled white wine. Hope you have a nice weekend !